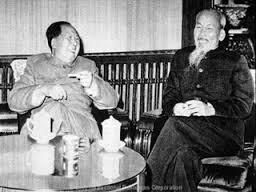 Objectives: describing conflicts and revolutionary movements in eastern Asia, including those in China and Vietnam, and their major leaders, i.e., Mao Tse-tung (Zedong), Chiang Kai-shek, and Ho Chi Minh. To Live China Lesson Plan: Lesson Based on the movie “To Live”. To Live Lesson Plan Type 2 : Another Lesson based on the move “To Live”. Mao Zedong Document readings worksheet: A worksheet where students analyze documents and answer questions. Mao Zedong Biography Questions: Questions related to the biography on Mao Zedong: China’s Peasant Emperor. Mao Zedong Hero or Villain Handout: Student handout where they analyze Mao’s quotes, complete a chart, and answer questions. Chiang Kai-shek Short Biography Reading: Biography reading on Chiang Kai-Shek. Vietnam War Reading Analysis: A student reading of primary sources (interviews) of those involved in the Vietnam War. Student complete a chart and answer questions. Vietnam War Schlessinger Video: A video question guide to go with the Vietnam War as produced by Schlessinger. Vietnam War Questionnaire Assignment: Student interview sheet where they select someone who involved in the Vietnam war and interview them. Vietnam War Questionnaire Assignment PowerPoint: Teacher-led PowerPoint where the class analyzes their responses. Vietnam Event Timeline: Timeline activity where students answer questions from the textbook. How did the US Get involved in Vietnam readings: A reading on how the US got involved. Vietnam US Involvement Reading: Another reading on how the US got involved in the Vietnam War.